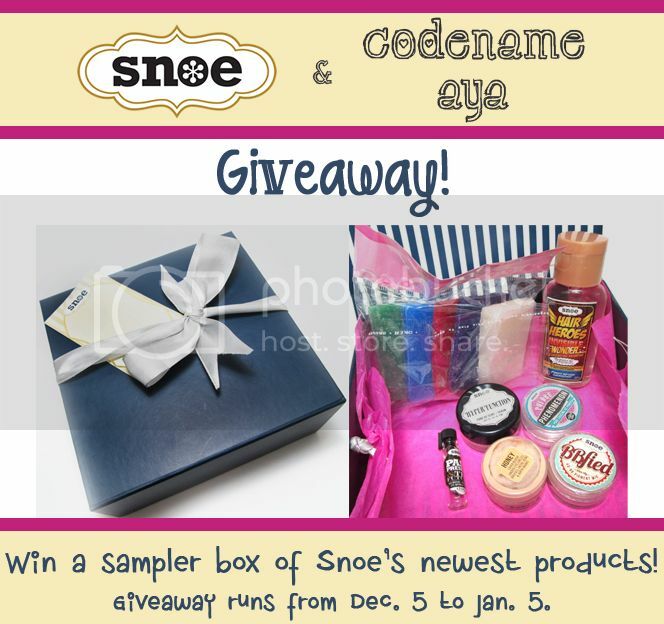 Today I'm giving away something from Snoe Beauty! 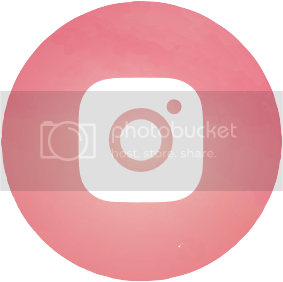 If you're not familiar with Snoe, you can check out my posts *here. * I've posted about a few of their products already. You have to try any of the Hair Heroes variants! I recently attended the launch of Snoe's newest products. *Read my post on that event here. * Trust me when I say that Snoe is really growing. They used to carry mostly skin care products, and now they have a lot more to offer - more promising skin care products, makeup and even beauty accesories. As mentioned, I'm giving away this box. 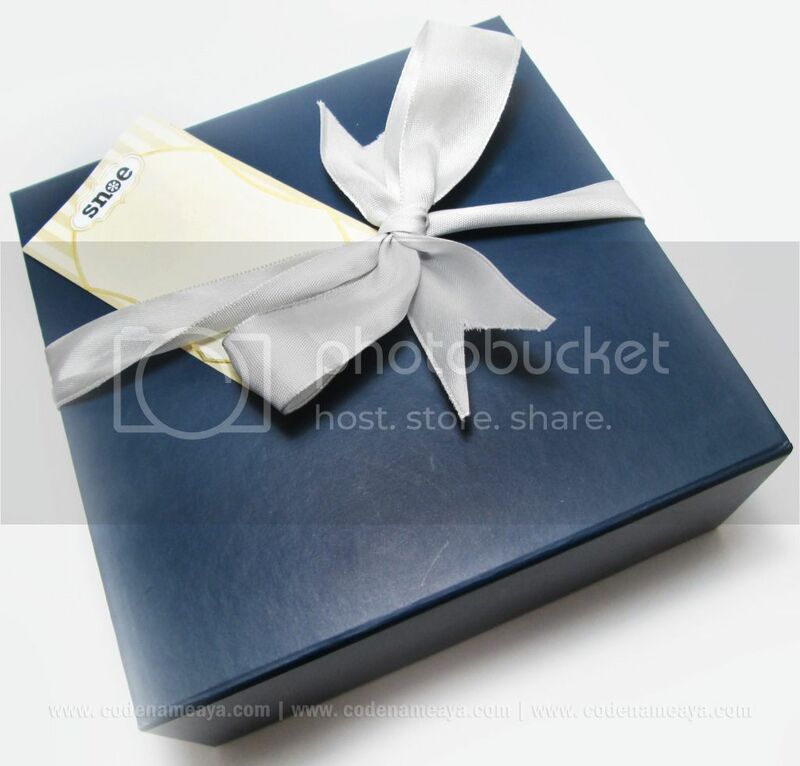 This very elegant-looking box contains samples of some of Snoe's newest products! ingredients, antioxidants and broad-spectrum sun protection." "Has skincare benefits of BB cream with added nourishing ingredients. Aims to provide more effective color correction." the appearance of skin imperfections and fits all skin tones." BB cream, tinted moisturizer, foundation or concealer." "Anti-wrinkle, anti-dark circles and anti-puffiness eye serum." "Made with only the freshest and purest high-grade ingredients to provide superior whitening solutions." I've tried a couple of these products already, and I'm liking them so far. I hope you stay tuned for my reviews. 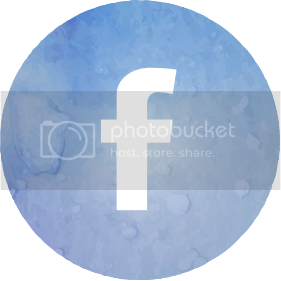 Like Snoe Beauty on Facebook. Like Codename AYA on Facebook. Share this giveaway on Facebook. Don't forget to tag Codename AYA. Tweet about this giveaway. Don't forget to tag @CodenameAYA. You can do this once per day. Use the hashtag so I can track your entries. Rafflecopter will guide you in submitting your entries so just follow the instructions and enter all the necessary information. This giveaway is open to Philippine residents only. 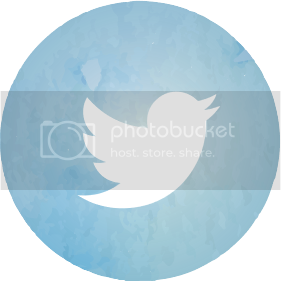 This giveaway runs for a month (Dec 5, 2012-Jan 5, 2013). One winner will be selected randomly. Announcement of the winner will be posted a few days after the last day of submitting the entries. The winner will have up to 48 hours to respond. The prize will be shipped directly to the winner so you must be willing to give me your shipping address in case you win. Participants below 18 years old must ask for permission to join from their parents. Since i have damaged hair.. im really eyeing on their hair serums.. i wanted to try their most coveted HAIR HEROES!!! I am now itching to try the cleansing oil shampoo. Ang dry ng hair ko ngayon e.
Id love to try BBfied HD BB Pigment Mix. Looks promising. I'm itching to try out the "Past, Present & the Future Eye Wrinkle Serum" because you can never be too young to start taking care of that particular area of your face! Would love to try Parallel Pigments CC Cream in Honey! I have some spider veins under my eyes! When I saw their stall in Robinsons Galleria, I got interested with their products. They're unique and affordable. The packaging is cute! Wow so excited for this! Congratulations, dear for your 2 years of blogging with so much love and passion! Anyway, I've been dying to try out the Snoe poudre! Read a lot of raves! I've been dying to try Hair Heroes because a lot of reputable beauty bloggers are raving about this product! Happy Anniversary! I really want to try the Parallel Pigments CC Cream! I've been aiming to have an effective product for my dark under eye circles and I think this is a perfect product to try on! It's not in the giveaway, but I'd love to try Snoe's Rouge Deluxe in Precious Pout. 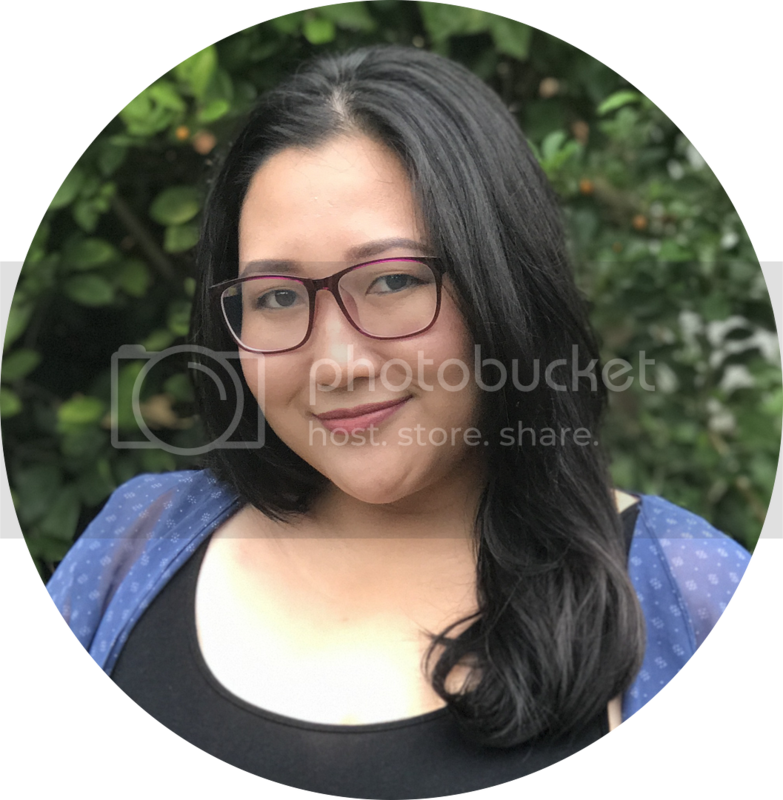 Congratulations on your blog's two years! I want to try this kasi I have finelines sa eyes ko.. I'd love to try Snoe's Rouge Deluxe in Precious Pout. I love lipsticks! I super want to try Snoe's Rouge Deluxe lipsticks and their Under Armed Forces underarm whitening spray! I would like to try the hair heroes line, I've read a lot of good reviews about them and I think it will help me maintain my hair :) Thanks for this giveaway! 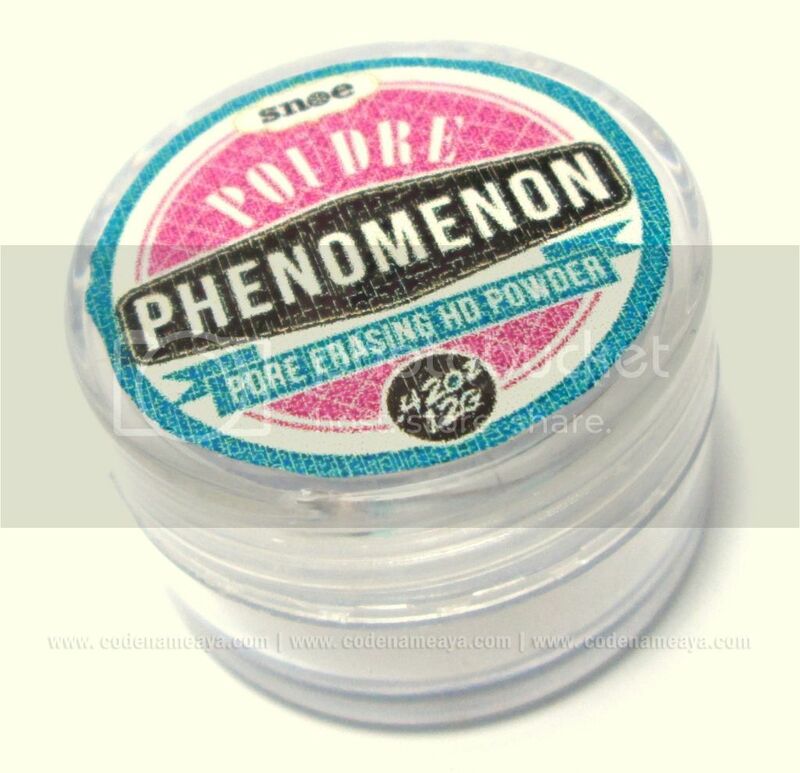 Poudre Phenomenon Pore Erasing HD Powder, I want to try if effective to my skin, cause I've been looking for this! i would like to try Past, Present & the Future Eye Wrinkle Serum for my wrinkles..
Id like to try the wonder cleansing oil.. interseting! i would like to try Past Present & the Future Eye Wrinkle Serum for my wrinkle. I would like to try everything! i want to try the Pore Erasing HD Powder, para matago nya un mga pore s mukha ko. hello! 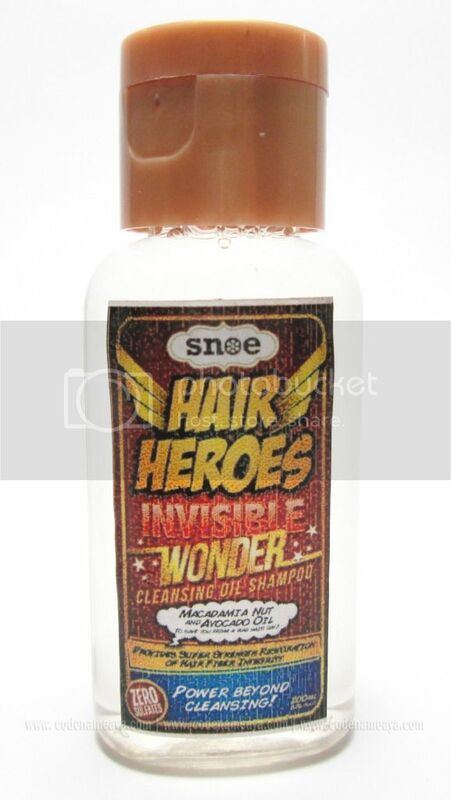 im itching to try snoe invisible wonder hair heroes, i already have the intense argan oil conditioner and the olive clementine shampoo and im loving them, i wanna try and collect all the hair heroes league! i want to try the cc cream! Powder. I wanna minimize my pores. i would really love to try the parallel pigments CC cream in Honey, beacause i really have problems with my skin, i have lots of veins around my mouth area and so much darkness happening around my eyes! 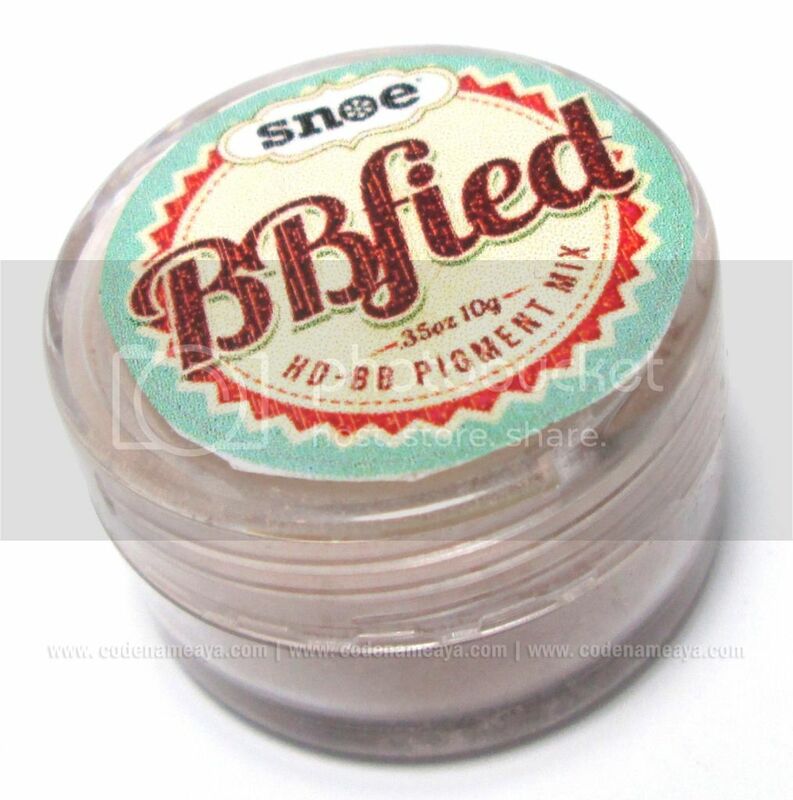 so i really want to try Snoe products because i heard a lot of good reviews and my friends also recommend it to me. i really hope i win this giveaway. BBFied HD Pigment Mix. im very excited to try this product because i love SNOE so much!!! I want to try the Poudre Phenomenon Pore Erasing HD Powder. It's use sounds so interesting. I wanna use this. I want to try Hair Heroes Invisible Wonder Cleansing Oil Shampoo hoping that it will help my hair problem. I wanna try Parallel Pigments CC Cream to hide my birth marks. wanna try the invisible wonder from hair heroes, i wanna try the entire hair heroes line!!!! Honey Cover Bluish Under-Eye Circles, Bruises, Facial Veins and Birth Marks since being a mother takes a lot of responsibilities and sacrifice. However, I still want to be a perfect wife to my dearest husband. 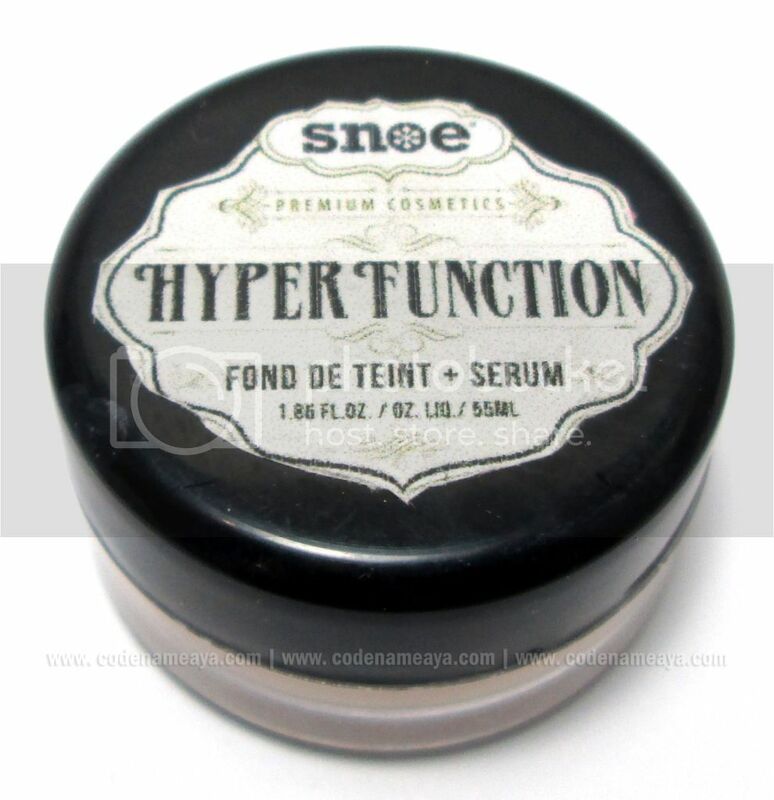 I really want to try the Hyper Function Fond De Teint + Serum because I like products that has perfect coverage. Aside from that I love that it contains antioxidants and has a broad-spectrum sun protection. Also, Im a big fan of BB Creams because it's an all-in-one product so it lessens my make-up routine and on busy days I just apply BB Cream and pat powder. 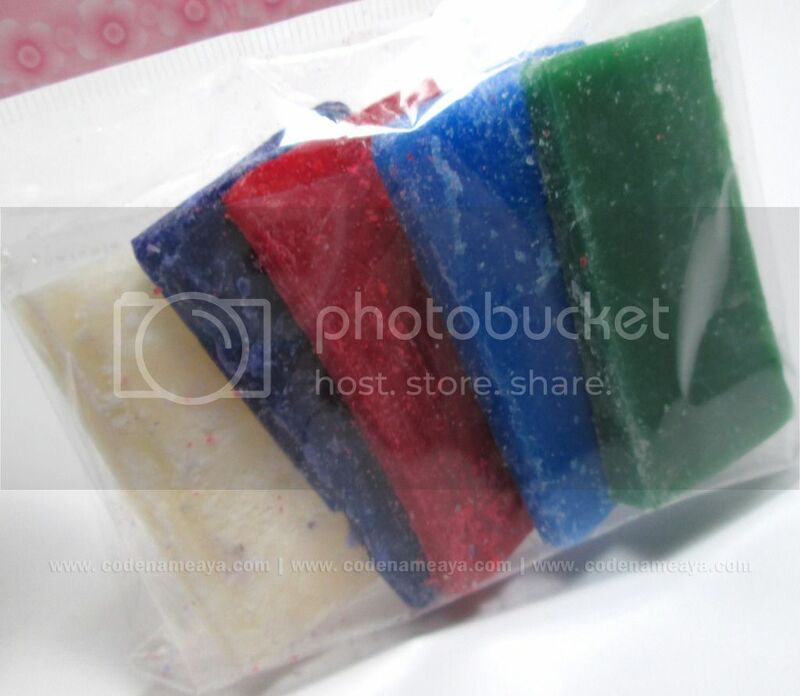 So, I also wanna try the BBfied HD BB Pigment Mix. This item will surely fit my ideas to cover up and correct to make my face more fairer with the super chick peg complection. hi , ako nga un nagcomment kay beautyjunkee non, lol nalimutan ko na!! I would love the Past, Present & the Future Eye Wrinkle Serum. Eye cream is a necessity to women my age and I would love this above all other products. I want to try this one because of the dark circle on my eye! 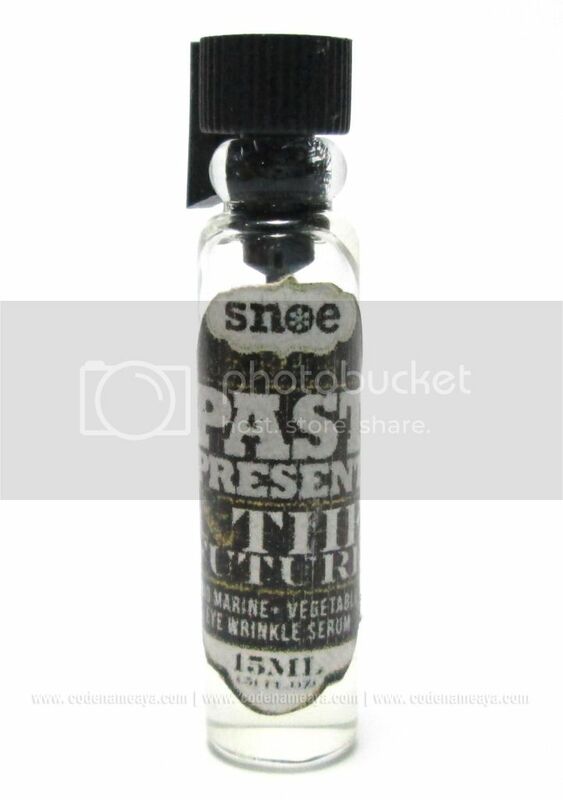 I want to try the Past, Present & the Future Eye Wrinkle Serum because my under eye circles are going crazy! I want them to get fixed ASAP! I want to try the Parallel Pigments CC Cream in Honey, i think it will help me a lot in hiding blemishes in my face. A registered chemist from the Philippines. Loves makeup and has a new-found love for glam planning. The type who wants to shop a lot without spending a lot.